Located directly opposite Rex Smeal Park and the historical old Courthouse. 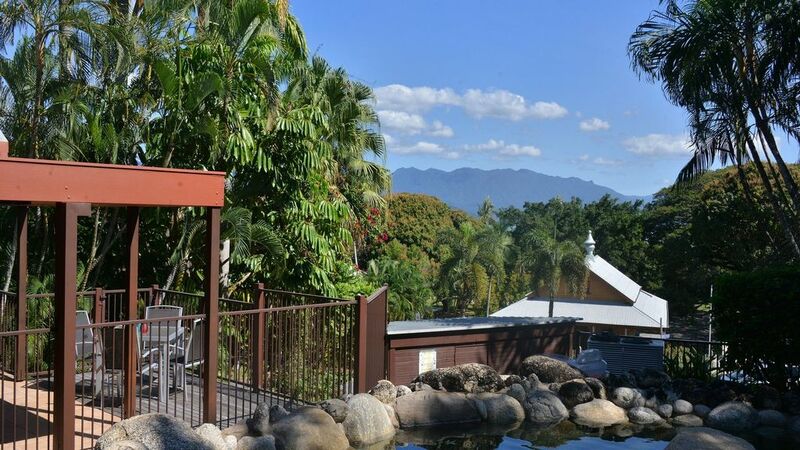 10 Wharf Street is the closest residential dwelling to the centre of Port Douglas. This beautiful home offers guests unrivalled access to both the park - with playground facilities, and Little Beach. Little Beach is the only beach on the inlet side of Port, sandy at low tide and a great place for paddling with small children. On Sundays, the park is home to the famous Port Markets. The Sunday session at the Courthouse Hotel is only a two minute walk away from the house. Entry is via a slate driveway off Murphy St into a double car port. The focal point of the house is the large, sunny and heated lagoon style pool located between the pavilions of the home. A choice of inside and outside living areas centre around a black granite kitchen with stainless steel appliances and breakfast bar. Dining choices include a casual outdoor setting by the pool, or a more formal table, also outside but undercover, overlooking garden. There is also a smaller table on the sundeck of the sleeping pavilion. There is a separate parents wing with sitting area, king bed and full bathroom with spa bath. Three other bedrooms, a bathroom and a sitting room are located in the third pavilion, joined by decking and undercover walkways. Ideal for guests wanting to participate in the social aspects of Port, this house has immediate access to the surrounding restaurants, shops, supermarkets and nightclubs. The property is fully contained with both perimeter and pool fencing. Combining this with its proximity to the park and beach, makes it a great vacation spot for families. All bedrooms have air conditioning with screens and fans. The tropical design does mean that the house is open to the elements with covered walkways between pavilions. Entertainment options include 2 TVs, CD, DVD, Foxtel, and wireless internet connection. Fantastic open living with swimming pool. Highly recommend the location which is walking distance to everything.